We've had some more vehicles arrive at Pendraken HQ, so here's a quick preview of them! These will be going into moulds later this month and released probably sometime in July. And then jumping forward a couple of decades, Mart has been busy working on some more items for our Modern Vehicles ranges. 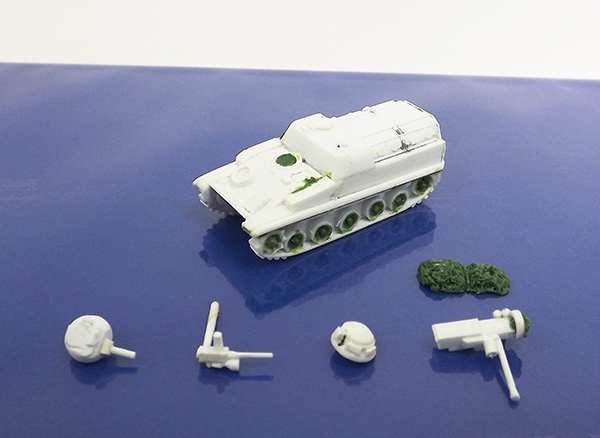 First up we've got a pair of self-propelled howitzers, both conversions of the US Walker Bulldog chassis. The first of these is the M44, adding a 155mm howitzer, which whilst it didn't arrive in time for the Korean War, was used by the US, Britain, Italy, Belgium, Greece and Turkey at various points from 1955 through until 1992. Secondly we've got the M52, this time with a 105mm howitzer. This one used an enclosed turret instead to provide more protection to it's crew against both conventional and nuclear weapons. Again, this vehicle was too late for the Korean War but was still used by both the US and Turkey (under the M52T designation). That's it for now, we'll have more previews coming soon!